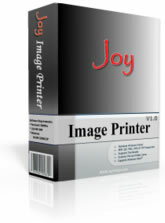 The evaluation version of Joy Image Printer is available here for download. You can freely download and install it on your computer for the evaluation purpose. This method allows you to try our products before you purchase it, If you have found the software to be useful, please purchase a license. To purchase a product, see the Purchase section. After placing an order, you will receive registration code via the e-mail and full download address as soon as the order is complete. If the internet connection has been terminated before the end of the download (size does not match) or if the download procedure returned damaged data (it may happen during a connection) then the install procedure will fail returning an error message. Delete the downloaded file from your hard drive. Then try to download the file from the same source. Or using a Download Manager such as: Net Transport, Getright. How to Install Joy Image Printer? Run the installation program(joyPrinter.exe), follow the instructions that appear on the screen. Please make sure that you have Administrator Rights to install Joy Image Printer. How to Uninstall Joy Image Printer? Run the Uninstallation program, Or open the Control Panel folder and double-click the Add/Remove Programs icon. Select Joy Image Printer from the list, then click the Add/Remove button. Follow the instructions that appear on the screen. Copyright © 2005-2009 Joy Software, All rights reserved.